People who think Winslow AZ is best known for being featured in the lyrics of a classic rock song have a lot to learn about this Arizona town. Winslow is a place worth visiting and not just to stand on that corner from that song. This visitors' guide should get you started if you're planning a trip there. 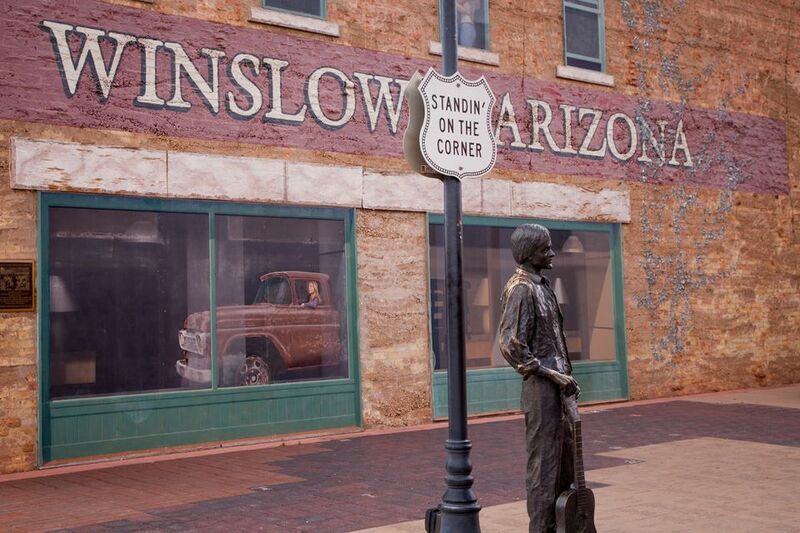 So many people come to Winslow to see the famous site of the song lyrics “Standin’ on a corner in Winslow, Arizona…” The lyrics from the song "Take It Easy", written by Jackson Browne and Glenn Frey, were made famous by "The Eagles". True, Winslow has a great little corner for you to see complete with a fantastic mural painted on a brick building façade and the statue, “Easy.” You can have your photo taken with “Easy” or close to the painting of the “girl in the flatbed Ford.” But, stop a while and see what is going on in Winslow. Some call the intersection of 2nd Street and Kinsley, The Corner District. There are gift shops across the street from the famous Winslow Corner and a Visitor’s Center. The Visitor’s Center is a great place to start if you want to find out more about Winslow. They’ll tell you about the wonderful park and walking path just a block away along the railroad tracks and about plans to renovate the brick trading post down the block. Stop awhile and pick up a pamphlet or two and enjoy the historic photos on the wall. What some don’t realize is that one of the gift shops offers up some history and architecture that is well worth a visit. Inside this former jewelry shop, is a fascinating high ceiling and intact antique safe. Their Route 66 merchandise is great fun to explore, a very unique experience. The gem of Winslow is just a short distance down the street. The first time a person drives through Winslow, they can be discouraged as it looks like it is under construction and was closed. The truth is that La Posada is always being worked on and is definitely not closed. The owners, Allan Affeldt and artist Tina Mion, purchased La Posada in 1997 and have been renovating this former Harvey House hotel ever since. La Posada is one of the special works of architect, Mary Elizabeth Jane Colter, architect for many creative Grand Canyon buildings including Hopi House, Hermit's Rest, the Lookout Studio and the Desert View Watchtower. La Posada was built in 1929 for the Santa Fe Railway. Mary Elizabeth Jane Colter was not only the architect that envisioned the unique hotel, she was an interior designer who determined which colors, textiles and china patterns would be used Affeldt and Mion are remaining true to the feel of Colter’s work if not recreating the hotel’s original décor. Stepping into La Posada is like stepping into a fantasy world. Not only is there the feel of Colter’s early southwest style creation, the whole building is a gallery of Mion’s bright and bold paintings. Two gift shops house wondrous tinwork, textiles, jewelry and pottery from around the world. Guests stay in simple but very nicely decorated rooms with wooden furniture, tin mirrors and original windows overlooking the grounds. While you hear enough of the train traffic to be transported to the Harvey House era, the hotel is fairly quiet. While you are there, be sure and take the self-guided walking tour of the hotel. A pamphlet available in the lobby points out details of interest. The Turquoise Room, separately owned by Chef John and Patricia Sharpe, yet a very integral part of La Posada. was another very pleasant surprise. Visitors can smell special food being cooked in the kitchen but few are prepared for how special the dining experience can be. The ingredients for meals are hand selected by the Chef who frequents the Farmer’s Market in Flagstaff, purchases from local growers and flies fish in from New Orleans, Boston and Alaska. They call the cuisine Regional Contemporary Southwestern and certainly does fit. One meal on offer is the Churro Lamb Sampler platter, which is very shareable. Churro lamb is a designated American Heritage breed raised on the Navajo lands for the past 400 years. Jay Begay, Jr. of the Rocky Ridge Ranch on Black Mesa raises lamb for The Turquoise Room. The meal was fresh, unusual and very savory. The menu makes for interesting reading due to the creativity of Chef Sharpe. It is hard to decide what to select. For those wanting something more familiar, the restaurant also serves Fred Harvey inspired dinners. The Turquoise Room is open for breakfast, lunch, and dinner. Winslow is a great place to get a feel for the old Route 66. Downtown Winslow is right on “the Mother Road,” and shops cater to Route 66 fans. Buildings, from La Posada to a vintage diner remain from the heyday of Route 66. The Old Trails Museum has an interesting collection of memorabilia documenting the history of Winslow and northern Arizona. It is located in downtown Winslow. ​Enjoy a cup of coffee, peruse the shops and enjoy the murals. Winslow, Arizona is well worth exploring past “The Corner District.” Winslow is also a great place to stay when you are exploring the local sights such as the Meteor Crater, Homolovi Ruins, and even the Petrified Forest.